We’re cementing our reputation as an innovative design partner by showcasing the world’s first modular felt ceiling system at Architect@work. HeartFelt® was developed in conjunction with Bjarne Hammer, who is part of the Schmidt-Lassen Architect a renowned studio within Denmark. 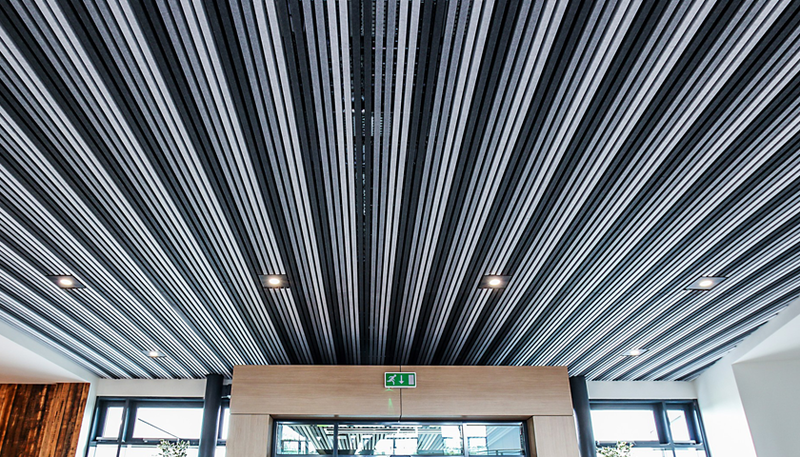 The Heartfelt modular and linear ceiling system has grabbed the attention of many architects and designers looking for innovative products for their next building project. Architect@Work exhibition was the perfect opportunity for Hunter Douglas to present this system to an audience of hundreds of architects and designers on a globally respected stage. The HeartFelt® modular ceiling has a number of different options to select from, the system is available in 6 sizes from 50mm to 100mm and has 5 different colour options from off-white to anthracite. This versatility makes it an ideal option for a number of different specifies. The entire ceiling is made from 100% recyclable material; this includes the carrier and suspension system not to mention budget friendly. The modular ceiling has been installed at the £15 million headquarters and stands out with the flexible system and acoustic properties. Working as a design partner with other companies across the building sector is an important aspect of the business for Hunter Douglas. They find themselves stepping into this role more frequently and the HeartFelt® development marks another success in this field. For more information about Hunter Douglas’s Heartfelt® Felt Ceiling system, visit it at stand 76 at Architect@Work, Olympia, London, January 25-26.